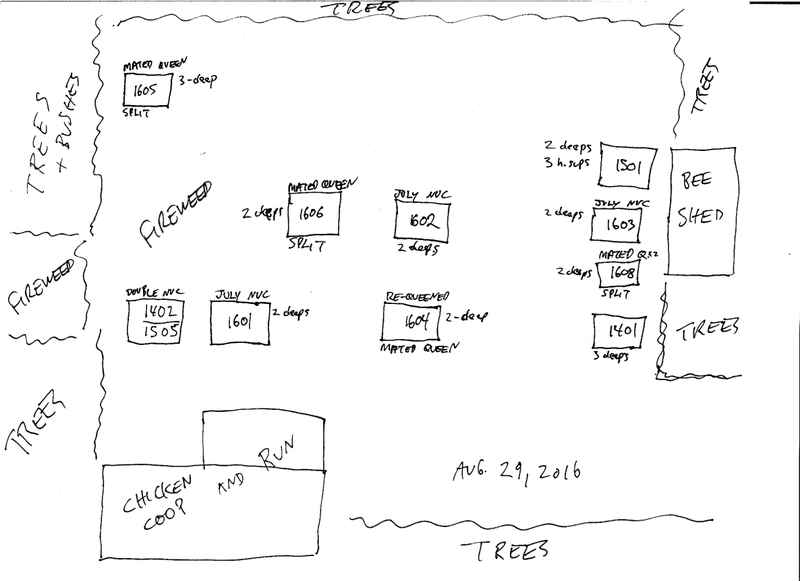 I drew up a map of my beeyard yesterday and wrote a summary for each of my hives to include in my beekeeping journal. I normally don’t post this kind of thing, but it may be of interest (probably not) for anyone curious about how a hobbyist beekeeper with a few too many hives keeps records. I’ve been meaning to keep more accurate and more concise records since I started beekeeping in 2010. Maybe next year. I currently have nine honey bee colonies in my beeyard, up from more or less two at the beginning of the year. (I had four back in March but only two of them got through the spring in okay shape.) I use a simple numbering system to take track of my queens (not my hives): The first two digits represent the year. The last two digits represent the queen. For example: the first queen of this year is 1601, the second queen is 1602 and so on. In my journal I also use some letters to indicate how the queen was created: through supersedure queen cell, swarm cell, mated queen from another beeyard, etc., but I won’t bother with that here. See my recent Beeyard Update for more details and a video. Click the image to see this baby in all its full screen glory. 1401 — My oldest surviving queen that has a full hive to herself. I thought she was failing but maybe she’s not. She was slow to get going like most of the colonies this summer. Today I moved the 3-deep hive (with a feeder) to it’s current location, which was the old location of the double nuc. So it’s going to lose a lot of bees here, but I think it’ll be fine. It’ll get plenty of sun and it’s still loaded down with nurse bees that aren’t going anywhere. 1402 & 1505 — They’re living in a double nuc box, 4 frames each. 1402 is a queen from an old big mean hive that I recently split into three (and I think the queen is actually from 2012). 1505’s old hive was requeened because she’s a supersedure queen from last year who didn’t seem to have been mated well. Both queens seem to be doing okay in the double nuc box though. It doesn’t get much sun in its current location, but I don’t care. I might move it completely out of the beeyard and bring it close to the house just for fun. It’s not a full hive of bees, so it doesn’t have much potential to get in anyone’s face. 1501 — The only successfully installed mated queen from last year. Started off slow. Gave them 5 frames of brood from 1402 when it was big. Then eventually removed 3 frames of brood when the hive exploded in August or late July and was a swarm risk (I should have just left everything alone). 2 deeps and 3 honey supers. Many of the honey super frames are full of pollen (that’s another story). I don’t see much capped honey yet. Not sure what to think. Plenty of brood hanging off the bottom bars of the bottom box for a several weeks now. Borderline swarmy perhaps but I don’t anticipate that with such a young queen this late in the year. I’m hoping for the best. Experimented with holes in the honey supers, but I’ll talk about that some other time. Nurse bees hanging off brood frames in the bottom box. 1601 — The first nuc I bought this year (July 18th) which was originally in the same position as the double nuc. I noticed it was slow to build up, probably because it was in the shadiest area of the beeyard. So today I moved it to where it is now, and where it is now used to be the location of 1401 which was overflowing with bees. So I’m hoping all the returning foragers from 1401 gave it a boost. Plus it’ll now get plenty of sun. I was feeding it for a while with a hive top feeder but recently stopped because I think I was feeding it too much, the syrup crowding the upper brood nest just a bit too much. It’s a 2-deep hive. 1602 — Another nuc started around July 18th. It’s coming along well. Like all the nucs, it’s benefited from some stolen brood from other hives and a constant supply of drawn comb, no bare foundation. I was feeding it until recently. I may start feeding all the nucs again in a week or two. Two deeps. 1603 — Started from a July 18th nuc. Added second deep after 2nd week, pretty much par for the course. Building up well like the others. All good. 1604 — My one requeened colony for this year. I requeened the 1505 hive to get rid of the old supersedure queen (who’s now living in the double nuc box). Requeened on August 6th. Coming along well enough, I suppose. No feeder at the moment. All my hives except 1501 have had feeders at one point or another this summer. 1605 — A split that was created with 1402 (previously what I called the big mean hive) and installed with a mated queen on August 6th (23 days ago). This hive is in the same location 1402 used to be, so it got all the foragers returning to fill it up quickly, with a large population of drones too. The last time I checked, the marked queen had filled several frames with capped and open brood and was off to the races. Her white dot has been mostly cleaned away. It currently has 3 deeps and is full of bees, though the 3rd deep is mostly empty, old dirty frames that I threw in there for the bees to clean up. I will knock it down to 2 deeps before winter. I stole some frames of brood from this hive recently for another late-season split. 1606 — Currently a 2-deep hive created from the aforementioned split on August 6th. The queen seemed slow to start laying and I’m not even sure how well she’s laying, but she’s alive and I see fresh brood. That’s good enough for now. I fed it for a while but recently stopped because it was getting too full of syrup in the brood nest. 1608 — An extra-late season split started from the aforementioned split on August 6th, but they killed the queen (there is no 1607) because they were in the process of superseding (or swarming). Long story short, I kept finding queen cells, so I destroyed all the open brood before I installed the second mated queen around August 12th or 13th. I can’t find the queen for some reason, but I spotted plenty of fresh brood. Good enough. I recently added a second deep and several frames of open and capped brood from other hives. Hoping for the best. So that’s it for now. I have 9 hives and 2 nucs — for 11 queens in total. That’s way more than enough. I have very little drawn comb left in reserve. Which isn’t good. So if I lose a hive or two over the winter, I’m fine with that. Never hurts to have extra drawn comb around. 1401, 1603 and 1608 are the only hives with feeders at the moment. I need to reassess and make sure I’m not blocking them up with too much syrup. 1606, one of the split hives, seems a bit off, but again it could just be a lull in the brood cycle as it probably took the installed mated queen a week or two to get back up to speed. And I’m not sure what will happen with 1608. It looks like they’ve accepted their second mated queen. Open brood, etc., but I can’t seem to spot the queen and I’ve noticed they were creating queen cups, possibly the beginnings of supersedure cells, a few days ago. Are they preparing to oust their new queen? Is that what they did with the first queen? I guess I’ll find out. But overall I think everything is in pretty good shape. I’d love to see the bees with enough honey to get through the winter on their own so I don’t have to feed them sugar over the winter. My goal for next summer is still to harvest honey from only half the hives and let the other half make enough honey in deep frames for themselves and all the other colonies too, so I never have to feed sugar to my bees ever again. That’s the dream. This entry was posted in Month of August, Mud Songs, Year 2016. Bookmark the permalink. Thanks for that Phillip. Useful. No doubt that good record-keeping is an important part of being a good beekeeper. It’s important to create enough space in your apiary for expansion, especially to handle splits (new nucleus colonies, etc.). This is a normal part of beekeeping, and yet, I have seen people make tiny apiaries, fenced tightly around their hives, with no room for additional ones. Someone mentioned that I must have a lot of money to spend on my bees if I have enough bits and pieces and so on to accommodate 10 hives. I wouldn’t go that far. Trust me, my beekeeping has never been advanced through any monetary privileges. I wish it had. My beekeeping aspiration are fairly modest because I can’t afford to think big. Not that I have any problem with anyone who can think big. Some of my best friends think big all the time. But yeah, the beeyard I have now came about on a modest budget through a dedicated effort, building it up (down and back up again) gradually over the years. Nothing big and fancy happening here. Having extra space and extra hive components has solved many issues I’ve encountered in my beekeeping. My general approach when I set up a new hive is to have enough space right next to it for another hive, because I never know when I’ll need to start up another hive in a hurry. I have 9 hives in my beeyard now, but I could have 20 if I wanted to, if I was absolutely completely insane. When I build a new hive, I also always anticipate it’ll be a 3-deep hive. Most of the time it won’t, but I’m always glad to have the extra deep (and frames) around. Drawn comb is of course worth its weight in gold. Thanks for sharing all of your experiences with beekeeping Phillip, it is encouraging. I too lost all of my colonies except for one, to shrews last year. From one colony in the spring I have built two strong colonies and two nucs to go into winter, all have a new queen. I need to consider getting new genes into the pool, but will address that issue next year, God willing. I will protect from shrews this year! I live by Trinity Bay, not too far from you as the crow flies. Ditto re. drawn comb worth its weight in gold. The lack thereof is probably the single most important challenge for start-up beekeepers. What’s the forage like in Brownsdale, Howie? What were you guys using for entrance guards? Did you have mouse guards in place but the shrews got through them? The mouse guards I’ve been using have 3/8″ diameter holes for bee traffic. But I’ve heard that some small shrews can squeeze through a 3/8″ diameter hole???? I agree with your drawn comb comment. I’ve got a nuc that isn’t interested in drawing any! Well half of one frame…that’s it. I’ve fed 1:1 syrup hoping that would help. Bought a few old comb and placed in it. Not sure how to inspire them to draw. In Newfoundland, at this time of the year when the nights (and days) are getting cold again, the bees naturally want to contract, not expand. It can be a challenge to get them to draw comb when they’re feeling the cold. I do this ALL THE TIME. During regular inspections when I have all drawn comb in the hive, I’m always inserting empty drawn comb into the middle of the brood nest. If I don’t have drawn comb, I throw in a foundationless frame or a frame of bare foundation. The bees are compelled to work on any empty space or empty comb that’s inserted between drawn comb. If the drawn comb on both sides of the empty frame is full of honey, they’re more likely to build comb and fill it with honey. If the drawn comb on both sides of the empty frame are full of brood, they’re more likely to build it up into a brood frame. I normally wouldn’t spell it out like this, but apparently it’s an overlooked technique — one that is crucial to building up from a nuc in the first year. This late in the year, I’d be cautious about inserting empty frame between frames of brood, though, because if it’s cold at night, it could chill and kill the brood. Some genetic varieties of honey bees will shut down at the first sign of cold. They expel the drones, they stop building new comb, they store nectar in the top of the hive and drive the queen and the brood nest down into the bottom box, etc. It’s safer to insert blank frames between honey frames. But either way, once the bees start feeling the cold, they begin to shut down for the year. I know from experience that some shrews can squeeze through half-inch mesh. Not sure about three-eighths. Great beeyard, thanks for sharing! There are many advantages to having resources to pull from when you need them. I hope your bees continue to thrive over the winter months- please keep us posted on how you prep them for the season. Interesting comments about the shrews. They seem to be a growing problem for beekeepers. I have mice guards to install but will probably use the 1/4″ mesh instead. Or whatever seems to work best. So far I have found 3 drowned pigmy shrews and 2 drowned mice in my “ant moats” since July. The ant problem is the least of my problems. Also about 20 slugs. I’m at the edge of the woods and these little critters are definitely interested in whats happening in my hives no matter what time of the year it is. The unglamorous side of beekeeping that no one talks about is hauling out dead vermin from the bottom of your hive stands! The shrews can get in through any entrance, top or bottom. I found no problem with the quarter inch mesh last year, so I plan to stick with it. I’ll use thumb tacks to secure the mesh again so I can easily remove it to clear out dead bees when necessary. I would like hive stands that rodents can’t climb up, but it’s way too much work for 9 hives and I like having my hives low because 3-deep hive with two honey supers gets tricky to handle, even worse if a high stand he making it higher. I’ve had slugs in my hives too. Big ugly disgusting slugs. So far they don’t seem to bother the bees, though. I’ve noticed recently the carpenters and earwigs getting into the hives at night. They’re not a problem either, but I wouldn’t want them in my hives with me if I was a bee. I’m basically in the woods, too, so all these critters will be impossible to get rid of. I see plenty of ants in the spring too.